The Trump administration wants to open some national monuments to mining, logging and grazing. HARRISBURG, Pa. – Most Trump voters in Pennsylvania think the president is doing a good job, but when it comes to protecting national monuments they have a sharply different opinion. 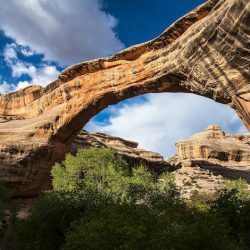 The president has announced that he wants to reduce the size of two national monuments that span millions of acres of wilderness in Utah. Others he’d like to open to commercial fishing, mining and grazing. But according to David Kochel, co-founder of RABA Research, its survey of Trump voters in Pennsylvania found that 90 percent of them support preserving the size and number of monuments, or creating even more.”The voters on the one hand support President Trump and on the other hand take a set of issues like this and say, ‘Well, that’s not exactly what I thought I was going to get or what I had in mind,'” Kochel states.Polling of Trump voters in Ohio, Michigan and Wisconsin produced similar results. Supporters of the president’s plan say it would help the economy by boosting industries.But Kochel points out that more than 70 percent of those polled have visited one or more national monuments or parks such as Yellowstone, the Grand Canyon or the Statue of Liberty – and they see them as symbols of national pride.”The ethos is very much America first,” he stresses. “We’re going to preserve our heritage, we’re going to preserve our monuments and our lands. “They take a lot of pride in things that are uniquely American.”Kochel adds that, even in these politically polarized times, support for national monuments is leading to coalitions that cut across the left-right divide.A report by the president’s interior secretary, Ryan Zinke, proposed reducing the size of several national monuments and opening more for commercial extraction. With midterm elections coming up next year, Kochel suggests this is an issue that could influence voters.”It is something that voters would act on and it might spell a bit of trouble for some candidates who want to pursue policies like Secretary Zinke has talked about,” he points out.